What’s the first thing that comes to mind when you think about growing your firm? If you’re like most people, you probably think about attracting new clients. All things considered, the more new clients you sign, the more your firm will grow. According to Jay Abraham, America’s leading business growth strategist, you’re leaving a lot of money on the table. 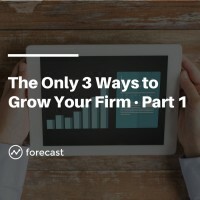 Abraham says there are 3 ways to grow a business. Each one of them is important. And when you make gains in each of the three areas, you’ll create “growth leverage”. In this lesson, we’ll explore Abraham’s formula for business growth and how you can use it to create growth leverage for your firm.